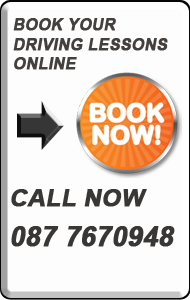 Easydive.ie offers you expert Pre-Test driving lessons Lessons, covering all driving test routes in Dublin driving test centres. You are guaranteed the best professional tution available from your ADI driving Instructor. For the best results the course should start from your local driving test or where suits you. It costs €170 to Fail your test for the second time. Most people fail more than 3 times due to lack of preparation. People dont fail or just scrape the test with easyDrive. Our pupils Mostly pass the FIRST TIME with just 1 or 2 minor marks. Money well spent! Aileen got 1 mark in her Driving test in Dublin! Passed easy in 2015. Thanks a mil ken for getting out of your sick bed to help me pass. Dedication at its finest. Still only getting over the shock at passing!! Thanks a million!! Damien got 2 Grade 1 faults. These faults dont even affect the test. Clean slate Passed easy in 2015. Thank you so much easydrive for the 6 hours driving lessons in Dublin. I didnt think i was ready before my driving lessons but after the mock driving test i knew i could pass this driving test. Explanation of how the test will be conducted. Vehicle engine and secondary checks. Theory questions / Rules of the road. Correct vehicle control with focus on coasting./ gears / brakes / steering. Junctions to the left / right with focus on position / observation / progress. Dealing with hazzards / clearance - with focus on overtaking /right of way/ anticapation / correct speeds to suit the condition. Cross roads / roundabouts / mini roundabouts / changing lane with focus on position / observation / progress.. In the last hour we will give you a chance at a mock driving test with our pre test expert instructor. Our expert driving instructor will take the role as a driving tester, taking you through the full process of the the test. You will start the mock driving test with questions on the rules of the road, Road signs, the vehicle technical check and vehicles secondary controls. Then we will drive for the duration of the driving test on actual driving test route while the instructor will be watching for mistakes. The mistakes made will be recorded on a driving test paper and then explained fully on finish. On completion of this course you will have a good understanding of each phase; you will feel sure and confident leaving no doubts of the test while passing with ease. So far in 2013 easyDrive Driving School has a 99% pass rate!! When booking this course please call about 3 days in advance of prefered date to insure you get a place. We cover the test routes for Dublin 5, Dublin 6, and Dublin 11. Take pre test lessons on any of the driving test routes in dublin 5,6, and 11. 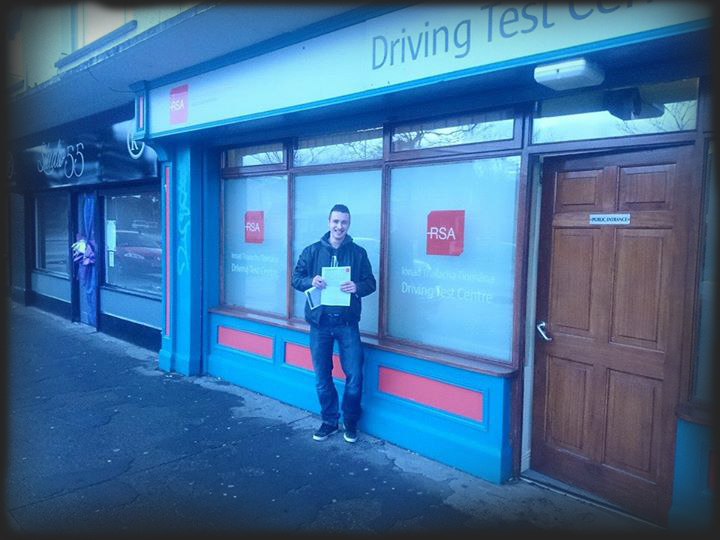 Congratulations to Damien from Dublin city centre passing in Dublin with easydrive.ie's short pre test course. Congratulations to veronica from Smithfield whom we from the beginning to test day. Veronica put in the hard work and passed her driving test with ease in Dublin only getting a small number of marks. 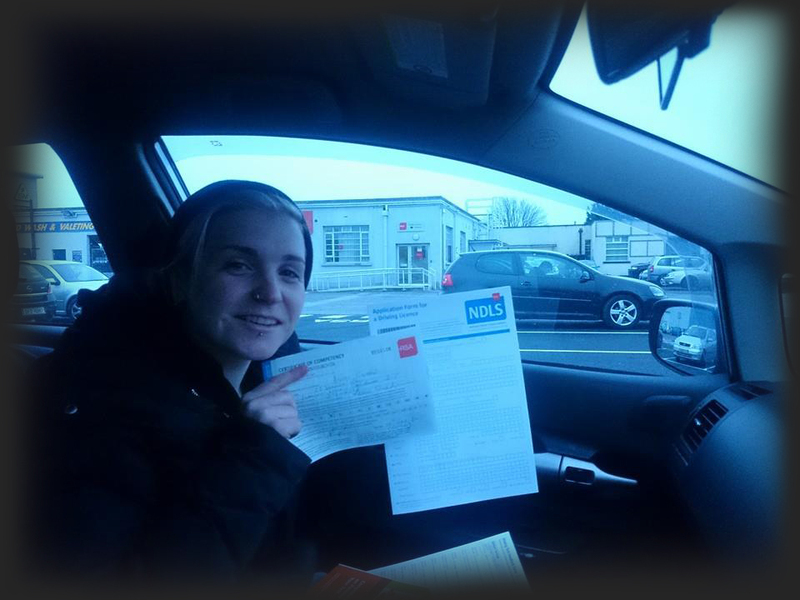 Congratulations to Vanessa keran passing her driving test first time in dublin with easydrive.ie. Congratulations to Daragh Killeen who passed his driving test today in Dublin with easydrive.ie's pretest lessons. Congrats to Robbie Carr for completing his edt lessons with easydrive.ie and passing his driving test in Dublin. Ruth Mc Carron well done for passing the test in dublin 11. I believe she had another college exam the same day , hope it went well. Well done to Marian Gill passing her test in with our short pre test course. Well done to Carl Hales passing the driving test in Dublin with a couple of pretests on Dublin driving test routes. Congratulations to Roisin fannin Passing her driving test first time in Dublin with our short Pre test course on driving test routes. Congratulations to Aaron Dillon passing the driving test in Dublin with some pre test driving lessons on test routes. Congratulations to Katie Dooley passing the driving test first time on Feb 4th in with our short pre test course on raheny driving test routes. Inner Relief Road, Buncrana, Co. Donegal. Test Centre 1:Doughcloyne Industrial Estate (Near Wilton Funeral Home), Sarsfield Road, Wilton, Co. Cork. Test Centre 2: Curraheen Park, Greyhound Stadium, Bishopstown,Co. Cork. WEXFORD Killeens (Beside Jeffares Osteopathic Clinic),Wexford, Co Wexford.